These miniatures, unusual in remaining together as a pair, showcase Meyer’s formidable skill as a miniaturist in the later 18th century. Born in Germany and moving to England at an early age, Jeremiah Meyer’s early training was with the enamellist Christian Friedrich Zincke and he was one of the first miniaturists to really exploit the medium of ivory, using transparent washes to allow the delicate tones of the ivory to show luminescent through the paint. Here, the sitter’s skin tones are enhanced by the ivory support, which is equally sympathetic, under Meyer’s confident hand, to the thicker gouache used to describe the sitter’s silk dress and her husband’s elaborately patterned waistcoat. The lilac colour of the female’s sitter’s dress was a particular favourite for Meyer and had been used for the dress in his 1772 portrait of Queen Charlotte [Royal Collection RCIN 420000]. Meyer was the oldest of a group of artists, including Richard Cosway, John Smart and Richard Crosse, all born around the same date, who took lessons at William Shipley ‘s new drawing school, the first such school in London. 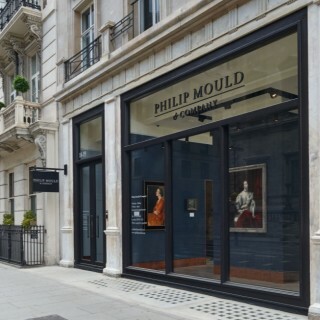 After his expensive apprenticeship with Zincke, it seems that he also spent time at the informal St. Martin’s Lane ‘Academy’ run by William Hogarth. As one of the founder members of the Royal Academy, which opened in 1769, Meyer was one of a new generation of miniaturists who would present their art form in direct competition with oil painters. 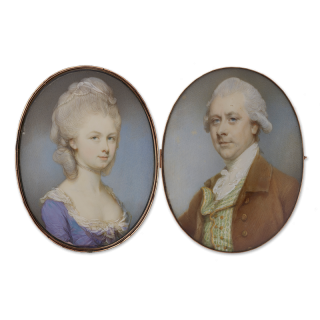 In 1764, Meyer was appointed miniature painter to Queen Charlotte and painter in enamel to King George III and a decade later, in 1774, one critic noted ‘[His] miniatures excell all others in pleasing Expression, Variety of Tints and Freedom of Execution’. When Meyer died, his widow sent his remaining miniatures, including portraits of the royal family, to the sitters without making a charge. The Queen was so pleased that ‘she liberally rewarded Mrs Meyer for her honourable conduct’. The present works are typical of Meyer’s linear style of painting and under magnification one can make out the network of hatching and the long, unbroken lines painstakingly painted by the artist to give the effect of light and shade. Here, Meyer has successfully conveyed the difference in age between the sitters – the clear complexion of the young lady in contrast to the shadowed eyes and sterner mouth of her male companion.